The overall decline of union membership is partly the result of the changing composition of jobs in the US. Healthcare, restaurant, and hospitality jobs are among the fastest growing and, historically, these industries that have not had high unionization rates. By contrast, manufacturing, a much more organized sector, has been losing jobs over the past few decades. Another contributor to unions’ reduced clout has been laws to make it more difficult to unionize, including “right-to-work” legislation passed in about half of US states. These laws stipulate that people who work in unionized workplaces do not have to join the union. 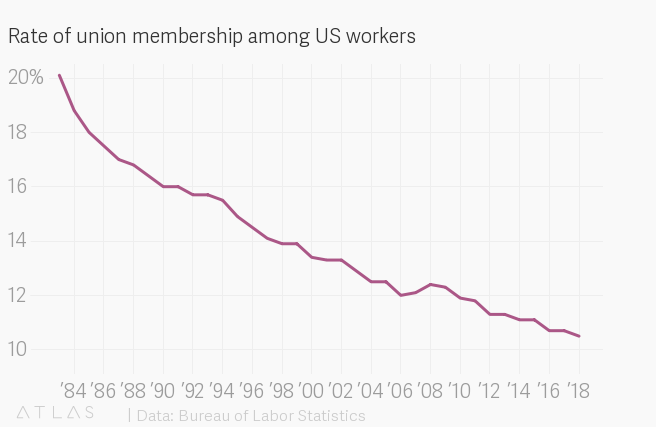 The US is not alone in seeing a fall in union membership. 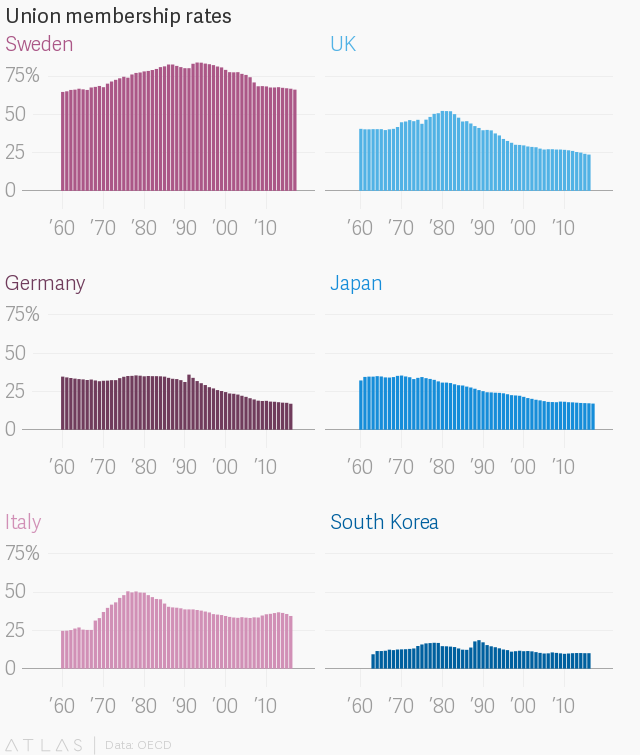 Across the rich world, nearly every country’s share of the unionized workers has declined, according to data from the OECD. The group notes that this is mostly the result of the shrinking manufacturing and public sectors, and the rise of contract-based jobs. Recent economic research suggests the decline of unions is one of main reasons income inequality has risen over the past several decades. A 2018 study by economists at Princeton and Columbia found that since the 1930s, unionized workers have made about 15-20% more than similarly educated workers. Unions are able gain this extra compensation by exerting collective power for workers who individually have little bargaining power. The downside of unions, from an economic perspective, is that they make it harder for companies to grow and hire more workers. The decline of unions may be one of the reasons that the US now has both a booming job market and rising inequality. Sure, there are tons of jobs available, but many of the low-skilled ones don’t pay very well. One of the main policy responses to falling union membership among progressive-leaning politicians has been to push for higher minimum wages. The logic is that if workers at companies are not able to bargain for higher pay, perhaps the better strategy is a government mandate. It seems to be working. Although unionization rates will probably keep falling, minimum wages have been rising.